Spanish Melons Grow the juiciest melons ever and enjoy sweet, flavourful watermelons, muskmelons, and honeydew this summer! There are few things better on a hot summer day than sitting down to juicy, home-grown melons. All melons are pretty easy to grow, so no matter if you are new to gardening or an old hand, make sure you plant some Spanish melons. 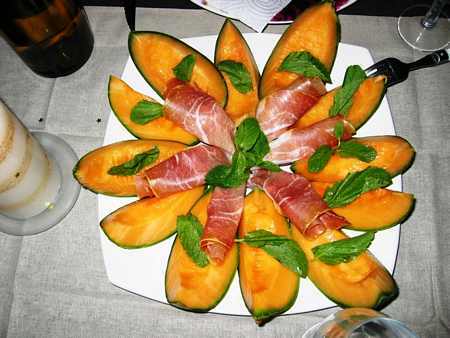 Many people have their favourite kind of melon, and although there are a lot of melons that can be grown, but most people tend to grow watermelon (Citrullus lanatus), as well as muskmelon (cantaloupe), honeydew, and piel de sapo (toad skin) which, are all variations of the same species Cucumis melo. These are all grown in much the same way, so whatever type of melon you decide to grow, if you follow the steps below, you will have fresh melon for breakfast or in a good fruit salad in just a few months. Choosing melon plants to grow the juiciest melons. 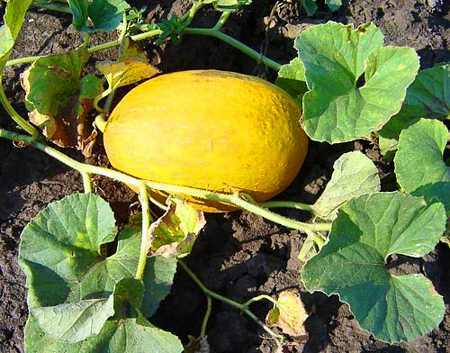 When choosing muskmelon, make sure you choose a variety that is resistant to powdery mildew. Powdery mildew usually develops as the melons are ripening and the energy the plant loses can rob the melon of their flavour. When choosing watermelon plants, look for varieties that are resistant to fusarium wilt and bacterial wilt. Choose long-vined cultivars rather than the short-vined or bush type. This is because long-vined will have fruit with superior flavour and texture because they have more leaves and can put more energy into fruit production. 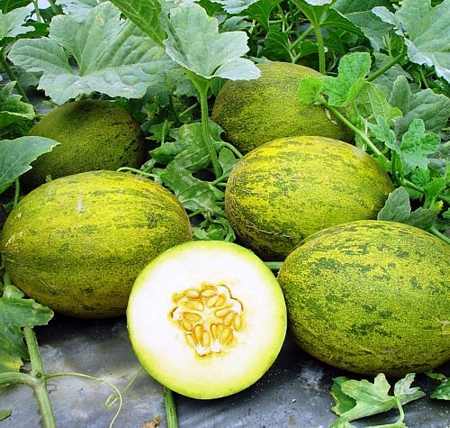 If you are short on space and need to grow a short-vined or bush type variety, then thin the fruit to two melons per plant to keep the fruit-to-leaf ration high. Melons like full sun, hot days, warm nights, and lots of room to grow. They also need a rich and well-draining soil. Melons really dislike extremely acidic soil, so choose a spot that has naturally alkaline soil, or has recently been limed. Planting and Spacing grow the juiciest melons. 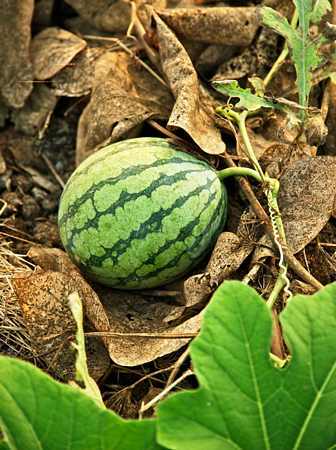 Melons need warm soil to grow well so now is a good time to start sowing them. 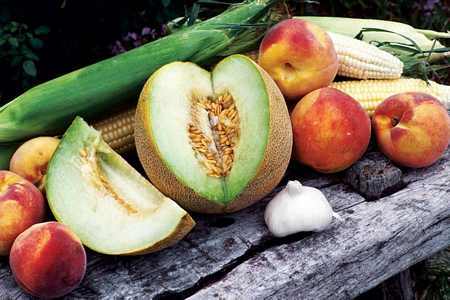 Like other cucurbits, melons can easily crossbreed, so allow plenty of space between different types or cultivars. To be completely safe from any accidental cross-pollination, keep them away from other family members including cucumbers, squash, and pumpkins. Apart from that they need room enough to sprawl. If planting in rows, put the seeds 8 to 12 inches (20 to 30 cm) apart with a few metres in between rows. Thin out if necessary. Melons need plenty of water while they are young and regular deep watering is especially crucial during the first 3 to 4 weeks that the vines are growing in your garden. That said, you can improve the flavour of the fruit if you do not water as often as the fruit ripens. 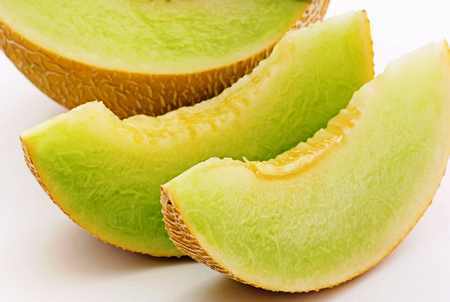 A good technique is to cut back on the water once the plants have begun to set fruit because overwatering dilutes the melon’s sugars and makes the flavour weaker and less sweet. This is a fine line, because you never want the melons to dry out completely, or get too stressed for water, because when you do water again, or it rains, the ripening melons can split. 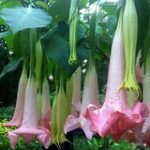 So simply reduce the water, but not to the point where you are stressing the plant. To give a steady supply of moisture, drip irrigation or soaker hoses are the best way because you are watering the roots directly rather than soaking the leaves. By keeping the leaves dry you can help prevent common foliar diseases such as powdery mildew which can affect the flavour of the melons. Fertilizing Melons to grow the juiciest melons. Melons can be hard to tell if they are ripe, but here are some common techniques. Muskmelons develop a thick netting over the rind, and the rind beneath becomes a lighter shade of green or even yellow. Watermelons: When ripe, the curled tendril at the stem end dries to brown and the underside of the melon turns yellow or cream-colored. The melon will also give a flat, dead sound when thumped. 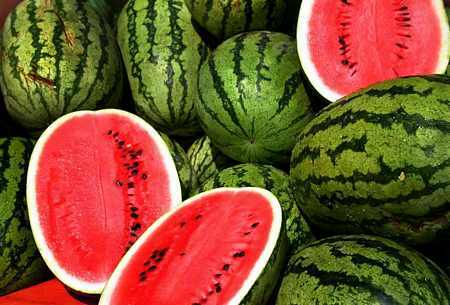 Rinds of unripe watermelons have a nice shiny gloss; ripe melons lose that shine, so the rinds are drab. Other melons: Slip from the vine when ripe. All melons will ripen a bit more for a couple of days after harvest, so store them at room temperature until they are totally ripe, then put them in the refrigerator or cool location for several weeks. John gives an update on growing mellons vertically, and some of the challenges he has faced. Including white powdery mildew, since it got dewey one morning. grow the juiciest melons. Try growing your Melon in a Cardboard Box. Nothing fancy just a cardboard box, which can be thrown away after harvesting. Now, if growing melons turns out to be too easy for you, try doing it the Japanese way: In Tokyo store space is very limited, but there are a lot of customers to sell to. The stores however, cannot have round watermelons because they take up too much room, and they have too much empty space around them. So they came up with the idea to grow melons inside a box! When the melons are fully grown, they simply take them out of the box and they can be stacked. It cuts down on transportation costs, and the grocery stores can handle them better. Japan has again shown off one of its greatest innovations – square watermelons. For years consumers struggled to fit the large round fruit in their refrigerators. And then there was the problem of trying to cut the fruit when it kept rolling around. But 20 years ago a forward-thinking farmer on Japan’s south-western island of Shikoku solved the problem. The farmer, from Zentsuji in Kagawa prefecture, came up with the idea of making a cube-shaped watermelon which could easily be packed and stored. To make it happen, farmers grew the melons in glass boxes and the fruit then naturally assumed the same shape. Today the cuboid watermelons are hand-picked and shipped all over Japan. They get square watermelons by growing them inside of square glass cases. That way they can fit easily into an overcrowded refrigerator, and you can stack things on them. Square watermelons are expensive though (10,000 yen or about $82). Compare that to regular round watermelons which cost about $15-20 in Japan. The square boxes they’re grown in are the exact dimensions of Japanese refrigerators, which means they fit perfectly. At $82 each, these square watermelons probably wouldn’t be too popular.